This aggressive karambit features a tactical design, wicked AUS-6 Stainless Steel blade, secure rubberized handle grip, full tang construction and "skull crusher" ring spike. 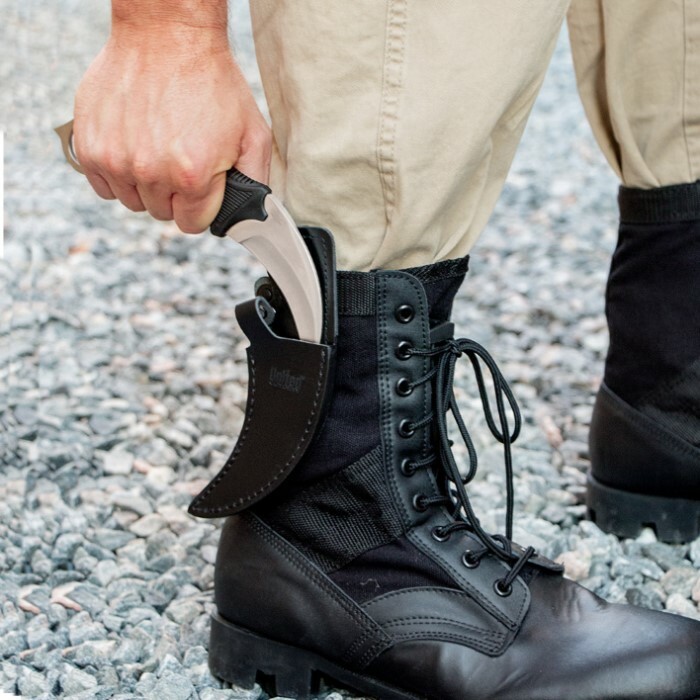 Includes leather sheath with clip for your belt or boot. 4 in. blade, 8 3/4 in. overall. Not the greatest but nice. Bought bout 2 ish years ago and I still use it. The tip was was oddly shaped which caused it to break but easy fix with my grind wheel. The sheath started coming apart at the opening almost as soon as I got it but nothing super glue didn't repair. I feel the sheath is uncomfortable and impractical on a boot so I use it on my waist and it feels great. 40 bucks is a bit much though unless you are a CS:GO fan. I have to agree with the other postings that the blade did not come very sharp...although the tip is very sharp. But overall, this is an awesome karambit for the price! The size is perfect for self defense. This is not an EDC. Once properly sharpened, the Honshu should be sheathed until the one time that it is actually needed (for self defense)...and hopefully that day will never come. I highly recommend the Honshu. fits well in my hand in both positions, it’s solid too, it’s edge was dall from tip to half way down the blade. snug firm fit in the sheath, secure locking snap that's easy to release when wanted. totally worth getting. the engraving you can get isn’t really an engraving it’s like a chemical stamp like the wording already on the blade, it does look good thoe. I just ordered my stainless steel Honshu karambit, and was very excited, but after use I realized that the index finger ring was slightly loose. If you know anything about karambit techniques if that index finger ring were to break while swinging the karambit out to hook, I could really hurt myself. I plan to call customer service and see if I can get another one sent out. I will post a follow up review to let everyone know. Also the strap that comes with it isn't like I thought it would be. It is basically half a suspender, which is still useful and it works, but it's a bit uncomfortable for EDC. I just got this karambit today and I have to say, it is amazing. It came razor sharp out of the box (I would expect no less from BudK or United Cutlery). The boot sheath actually works better, for me anyway, as an inside the waistband sheath. I absolutely love the design of the snap on the sheath because it is like a quick release due to the small piece of metal on it. The handle is extremely comfortable in the hand both in reverse grip and standard grip. Thank you so much for this amazing product BudK you guys are the best! Dude why is it some people be getting good shaped and sharp knifez and some get them poor crafted tipped and dull bladez cause mine ended up with a ROUND TIP BLADE THATZ NOT EVEN SHARP!!! 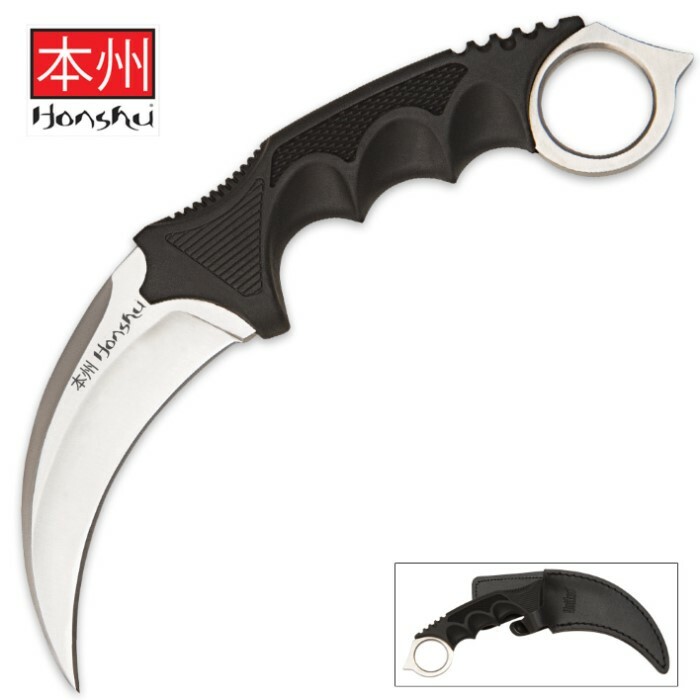 The Honshu Karambit is a large sized karambit. It comes very sharp, and the nice rubber overmolded handle is almost too big, but isnt. I have bought about 20 honshus and 1-2 of them had small defects that Budk replaced no problem. If you want a smaller cheaper karambit, the black legion karambit also offered by budk is a good alternative. Very good knife. I got two of these, one for me and another for my older brother, and they both came nice and sharp in a neat package. Not thrown around like some other things ive ordered offline. I only have two very minor conplaints. The first is that the blade and sheath were slightly dirty, but a quick wipe with a paper towel took it all off. The other is that, on the edge of the blade, near the tip, there are some very small marks in the blade, kinda shaped like waves, like one side of the sharpening machine vibrated ever so slightly and slipped on the blade. Luckily it was an easy fix. Just a quick run on a sharpening stone had it good and straight. I would recommend this knife to anyone looking for a knife of this kind. "Good Blade, Not Good for Carrying Around"
The knife is well crafted, EXTREMELY sharp. I accidentally cut myself just by lightly touching the blade; I had no idea it was going to be that sharp. The sheathe isn't the greatest; it's pretty cheap leather and the button doesn't clip on properly. When I got this in the mail, I was a little surprised by size of the entire knife. Karambits are generally small knives, but this one is massive. The pommel would be more comfortable to use if the hole was smaller. Overall I would say it's a little better than your average blade. I wouldn't recommend it because it's not a convenient blade to have around at all, it's too big to have around casually.